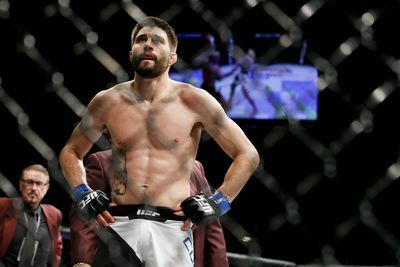 LAS VEGAS — Carlos Condit had his mind made up going into his UFC 195 welterweight title fight: It was all or nothing. He had previously held the WEC championship and the UFC interim belt. But his matchup with Robbie Lawler was going to be his second chance at the UFC’s 170-pound belt in a sport in which three shots at the same belt are rare. Condit and Lawler fought a thrilling battle, a Fight of the Year candidate just two days into the new year, and many felt he won the bout at the MGM Grand Garden Arena. But he came up just short on the judges’ scorecards, as two out of three 48-47 cards went Lawler’s way. And in the immediate aftermath, Condit is pondering whether the fantastic effort we saw on Saturday night will be the last we ever see from him in the Octagon. Condit, who will be 32 in April, has fought 39 mixed martial arts fights and four kickboxing bouts in a pro combat sports career which dates back to 2002. And he’s rarely held back in his fights, as proven by the fact 28 of his 30 career wins have been via finish. Perhaps this is simply what goes through a fighter’s mind after a big career disappointment. There’s clearly big fights awaiting the Albuquerque native if he so chooses. Lawler, for his part, is already lobbying for a rematch, and UFC president Dana White, while not committing to anything, isn’t about to rule a rematch out, either. Can ONE Championship’s experiment with weight cutting benefit the entire sport?